The United Guam Marathon, which is expecting roughly 4,000 participants, is on April 14th. 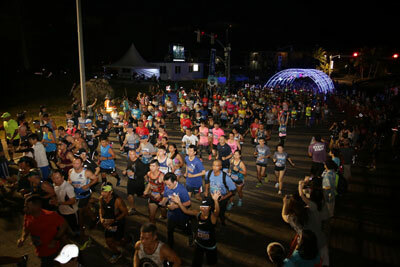 You can register for the 5K, 10K, half-marathon or full-marathon race online at www.unitedguammarathon.com until April 9th. You can also register at the two-day Hafa Adai Expo on April 12th and 13th at PIC. At the Expo, you can purchase event merchandise and engage with local vendors and UGM sponsors who will be providing great giveaways and activities for all visitors and local residents. The United Guam Marathon is the biggest and best running event on island and is an event everyone can enjoy! You don’t have to be a runner to join in on the fun. Get more information on how you can volunteer and support this huge event from the UGM website! 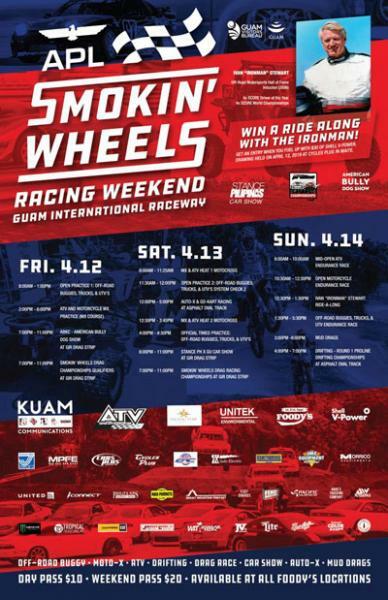 Smokin' Wheels is all weekend at the Guam International Raceway in Yigo. You can purchase a $10 day pass or $20 weekend (3 day pass) at all Foody’s locations. Children under 11 years old are free. No outside food, drinks and coolers are allowed, but there will be lots of ice-cold refreshments, snacks and food from local vendors, plate lunch vendors, and food trucks throughout the event weekend. Smokin’ Wheels is the biggest and longest running motorsports event in the Pacific region. Since 1978, it has been the premiere event for Off-Road Endurance Racing, Off-Road buggies, 4x4 truck challenge, as well as Motocross, ATV racing, Drifting and Drag Racing. This year over 100 world class racing participants will be coming from Japan and the US to compete in this annual event and will also feature guest driver and motorsports legend, Ivan “Ironman” Stewart. Stop by to check out all the racing events at Guam’s premiere raceway. Smokin’ Wheels is designed to excite and entertain the expected 10,000-plus racing enthusiasts both military and local! Good luck to everyone participating in all the events this weekend! Runners, racers and spectators, we’re in for an exciting journey to the finish line!